Other names: Buah setei, Medang. 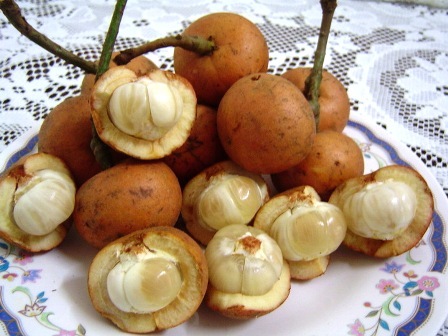 Tampoi is a fruit from South East Asia. It is most common in the jungles of Borneo. The fruits taste good and the taste is somewhat resembling that of mandarin oranges. Tampoi is not cultivated. 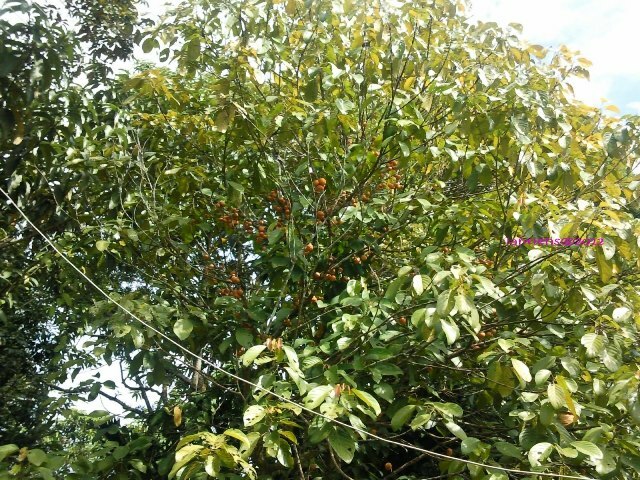 The fruits are harvested from wild and are also sold in road side fruit shops to visiting tourists. A small to medium sized evergreen tree, 5-29 m high. Leaves: petiole 22-145 mm long, glabrous to sparsely hairy, brown to blackish when dry, raised glands usually present; stipules 2-9 by 1-5 mm, glabrous to tomentose outside, glabrous inside, margin ciliate, not hyaline; lamina (ovate to) elliptic (to obovate), 9-37 by 3.1-17.5 cm, leathery to papery; base attenuate to cuneate (to rounded); apex (obtuse to) acuminate to cuspidate, up to 20 mm long; upper surface glabrous, some-times granulate, brown to greenish when dry, nervation brown to rarely whitish when dry; lower surface (sub)glabrous, mostly sparsely hairy on midrib and secondary veins, raised glands absent or present, discoid glands in a row between secondary veins, green with brown nervation when fresh, brown to greenish when dry; secondary veins 6-10 per side, not completely parallel, ending open at margin; nervation reticulate to weakly scalariform; young leaves blackish brown when dry. Staminate inflorescences, staminate flowers 0.7-2 mm diam., green to yellow to white; pedicel 1-2 mm, upper part 0.1-1.5 mm long, densely hairy; sepals 5, elliptic, 0.7-1.5 by 0.4-0.7 mm, apex straight, outside and inside densely hairy; stamens 5 (or 6), 0.1-0.25 mm long, glabrous, yellowish; ?laments 0.1-0.2 mm long, straight; anthers c. 0.1 by 0.15 by 0.1 mm; disc absent; pistillode globose to obtriangular, c. 0.5; pistillate flowers 2-4.5 mm diam. ; sepals 4-6, ovate, 1.5-2.8 by 1-1.3 mm, outside and inside densely hairy, persistent; ovary globose to cylindrical, c. 2 by 1.2-2 mm, 3- or 4-locular, tomentose; style 0.5-1.5 mm long, c. 1 mm wide, sparsely hairy; stigmas 0.5-1 mm long, cleft, persistent to caducous; lobes c. 1 by 0.4 mm, (sub)glabrous. Fruits (sub) globose, (2- or) 3-6-seeded, fleshy capsules, 30-65 by 34-75 by 34-75 mm, up to 80 mm diam. when fresh, loculicidally (and also septicidally) dehiscent, (sub)glabrous outside, subglabrous to densely hairy inside, raised glands present, brown to yellow to orange to dull red to dark green; pericarp 4-11 mm thick; column 16-32 mm long, straight, caducous; pedicel 7-30 mm long, upper part 5-20 mm long, thick-ened at abscission zone. Seeds globose to ellipsoid, laterally flattened, (to triangular), 13-23 by 11-18.5 by 4-7 mm; arillode white to yellow to sometimes orange; testa yellow to brown; cotyledons 9-15 by 9-19 by up to 1 mm; radicle 1-2.3 mm long; endosperm c. 1 mm thick. The fruits are eaten out of hand. They taste a pleasant mix of sweet and sour. The flavour resembles somewhat that of mandarin. These are also offered for sale along road sides. Wood is strong and durable. It is used in construction. Tampoi trees mostly grow wild in forests and common land. These are sometimes planted in gardens for collection or as specimen plants. This fruit is yet not grown on commercial scale.